That’s what Alicia de Larrocha always said, I’m sure. Viola jokes, now with visuals! One of my lovely Twitter followers sent this to me. I award him the Ain’t Baroque Medal of Valor the Well Played! Ain’t Baroque Medal of Violar. CP is SMRT. See it in its natural state here. Why write when you can hit things and make loud noises? 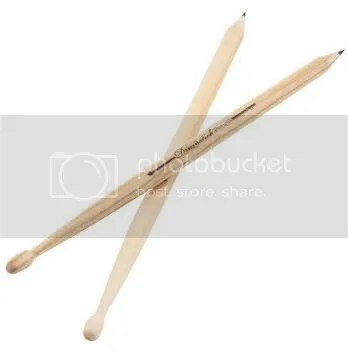 They’re drumstick pencils! Drumstick! Pencils! Why not play Mom a lengthy percussive solo? Means more than chocolate! Also perfect for your theory professor, band director, and the hyperactive fifth grader who isn’t going to write anything anyway so you may as well keep him occupied. They’re ten bucks for a set of two and you can get them here. The BSO’s new Musicians’ Concierge page is now up and ready for you! That’s the program wherein you fill out a form indicating your musical preferences, and a real, live BSO musician constructs a list of BSO concert suggestions upon which you can base your season package purchase. The form asks logical questions like your favorite composer, genre, period, etc., and you can even pick which musician you want to assemble suggestions from an available list. Which is not to say the other concerts aren’t awesome, but I had to narrow it down somehow. What are your picks? This week’s BSO concert is entitled “Russian Perfection,” because, let’s face it, where classical music is concerned it usually is. The program starts with a new piece by a Baltimore composer named Jonathan Leshnoff, then Rachmaninoff’s Symphony No. 2. But the best is saved for last: the Stravinsky Violin Concerto performed by Gil Shaham. He liked Bach. A wise man. The full concert is on Thursday, April 29 at 8 pm at Strathmore and Friday, April 30 at 8 pm at the Meyerhoff. There’s also an Off the Cuff concert on Saturday, May 1 at 7 pm with just the Rachmaninoff if your taste runs that way, but I think you’re silly to skip the Stravinsky. (WDanai) Great filmmaking to seamlessly incorporate such a phenomenal piece of music. With Habanera’s motif starting in a minor key (after the sadness of Ellie’s passing) and progressing into a major optimistic tone, I think that shows the strength of Carl to carry on, stubbornly.﻿ This transition is so important for the film. My work here is done, and I hardly even had to do any work. How did he get IN there?! Q. What do you say to a violist in a three-piece suit? I was wandering Columbia Mall waiting for Lenscrafters to make my awesome and way overdue new glasses when I came across this guy in Nordstrom’s. I summoned all my courage to stand around awkwardly while waiting for him to finish the current piece and then awkwardly asked if I could post his picture to my classical blog. He noted that he was playing jazz standards, not classical, but I hastened to assure him that this was of no importance. Then I walked out of the store, awkwardly. 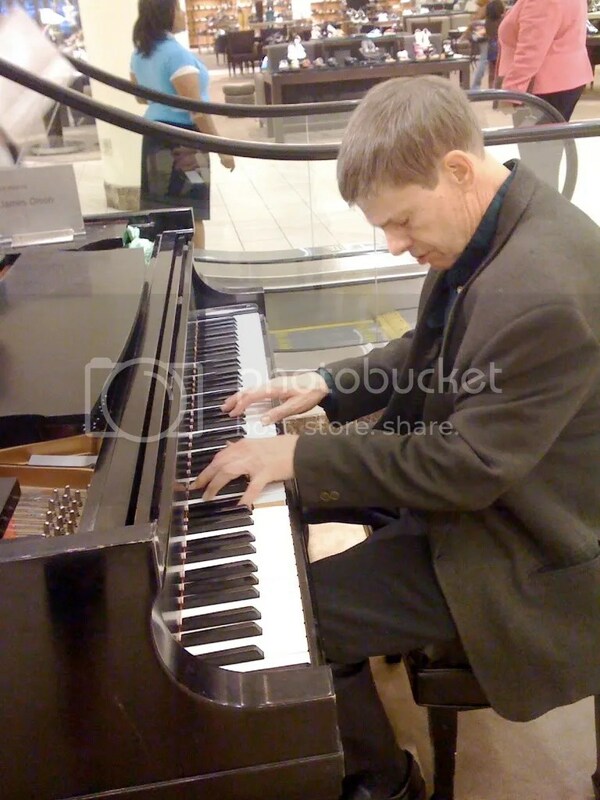 It isn’t important what he was playing, because my idea here is less about the music itself and more about changing practices. Look, maybe old movies are misleading me, but my understanding is that pianists in stores and restaurants used to be de rigeur. Now you almost never see them. Or I don’t. Maybe I’m not frequenting fancy enough establishments. Should we bring this back? Or should music clearly intended to fade into the background in the first place be allowed to fade entirely?